Winston Churchill in the Canadian Parliament, December 30, 1941. Churchill was widely known for his witty and powerful use of the English language. Of Neville Chamberlain's policy of appeasement prior to World War II, Churchill said, "An appeaser is one who feeds a crocodile, hoping it will eat him last." 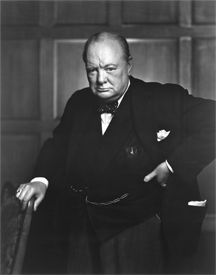 Photo "The Roaring Lion" by Yousuf Karsh, courtesy Library and Archives Canada, via Wikipedia. This is Part III of my series on managing the risks of interrupting fellow attendees at meetings. In Part I I examined assigning roles that have prior group approval to interrupt when certain conditions are met. I also described a "process check" custom that enables attendees to halt the proceedings when a violation of norms has occurred. In Part II I explored three approaches that any attendee in any meeting could use, and examined the risks of each. In this Part III I examine three more methods individuals can use. For convenience, I'll use the name Inez for the interrupter, and Steve for the speaker. Wit and humor are frequently confused, possibly because the boundary between them is so fuzzy. Some remarks can be both witty and funny, while others are clearly one or the other. Both are helpful to the prospective interrupter, but wit can be more effective, because it's usually clever or insightful, and it might be more directly connected to whatever is happening in the present moment. And the "wit bar" is actually fairly low. Example: "I agree it's a complex problem, but many complex problems have simple solutions. Let's search a little while longer." Because witty remarks can be difficult to generate on the fly, it's most fortunate that they need not be original. Having a stock of them in your mind is both helpful and possible. For example, when the topic is continuous, incremental change, it's useful to cite the Chinese proverb that advises, "Two leaps per chasm is fatal." Become a collector of witty aphorisms: there are dozens of books and ebooks available. Chiasmus is a particularly powerful form: Never Let a Fool Kiss You or a Kiss Fool You. Or check Web sites such as: "50 most inspirational quotes from books." As with all interruptions, brevity is power. One form of deftness is offering your comments in the form of questions, especially if directed at the person interrupted. Examples: "Have you considered…," "Is it worth contacting them about it…," "Is it possible that those two systems are interacting in some other way…," "Do you know how the regulators would react to that idea…"
they need not be originalcan be effective because they inherently cede the floor to someone else other than the interrupter. They're less likely to be seen as tools for seizing control of the discussion and therefore less likely to give offense. Courage is most useful when you disagree with the speaker. If you're confident of your position, and your relationship is solid, directness might be most effective. Examples: "I see it a little differently…," "I have to disagree on that…," or "We actually found them to be very reliable on the Marigold work…"
If there's room for debate or uncertainty, a less direct approach might work better: "I've heard from Erica in New York that their approach is getting great results. How do our projections compare?" Note the use of our instead of your. Our is less confrontational. Even less directly, Inez can challenge Steve's position by combining his position with all others, offering a radically different perspective: "Here's a wild idea — what if…" Being radically different, and being at odds with all previous thinking — not just Steve's — enables Inez to avoid singling out only Steve. He's less likely to feel targeted. Would you like to see your comments posted here? rbrenxZnHSPlNQeHKjnDyner@ChacLyVtmoPGcDTvFhneoCanyon.comSend me your comments by email, or by Web form. I offer email and telephone coaching at both corporate and individual rates. Contact Rick for details at rbrenUzGUUXjGHoPKclEQner@ChacRrvOQrRRWtLUPkmKoCanyon.com or (650) 787-6475, or toll-free in the continental US at (866) 378-5470.